Emirates has announced a raft of changes to Australian flight schedules, with travellers set to feel the impact from next month. The changes will see temporary and permanent downgrades from Airbus A380 to Boeing 777 aircraft, as well as a scaling back in frequency on the Perth – Dubai route. These changes could be quite significant, particularly for business and first class passengers. 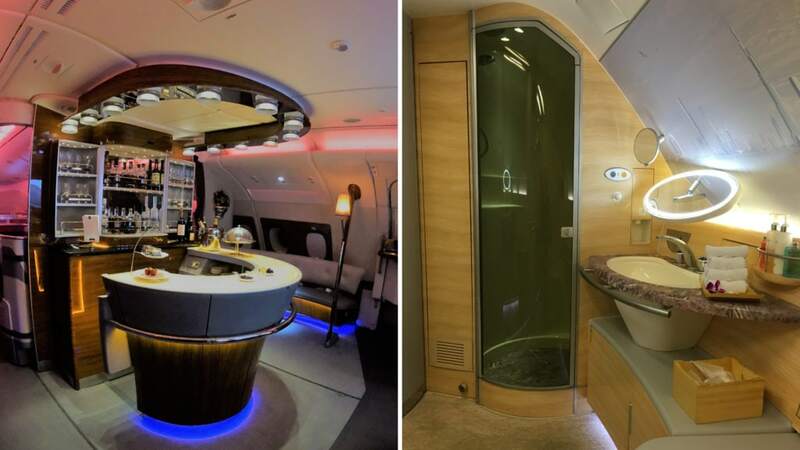 While the Emirates A380 offers the iconic Emirates business class onboard bar and decadent first class shower spa, the Boeing 777 aircraft is not equipped with these features. Business passengers may also see a downgrade in seat configuration and possible sleep quality. While the Emirates A380 business class cabin boasts lie-flat beds and direct aisle access, the current Emirates Boeing 777 is fitted with angle-flat beds and lacks direct aisle access for some passengers.I’m personally disappointed to see two of my favourite Emirates medium haul routes (Melbourne – Singapore and Sydney – Bangkok) downgraded to a 777 aircraft from early next year. Both routes offer exceptional value at just 90,000 Qantas points one way in first class.For me, the replacement of the A380 aircraft with a 777 (depriving passengers of the bucket list-worthy bar and shower) removes some of the sparkle on the Emirates first class experience. You’ll find the full list of affected routes below. From 2 November 2018 until 20 November 2018, the current A380 servicing EK404 and EK405 will be replaced by a Boeing 777-300ER aircraft. Effective 15 January 2019, this change will be made permanent. Effective 15 January 2019, the current A380 servicing EK418 and EK419 will be replaced by a Boeing 777-300ER aircraft. From 28 October until 30 November 2018 and also between 1 February until 15 April 2019, Emirates will replace the current Boeing 777-300ER with a Boeing 777-200LR aircraft on these routes. It’s unclear whether this aircraft will be fitted with the upgraded 2-2-2 business class cabin, or if it will feature the standard 2-3-2 configuration. If it’s the former, Adelaideans (myself included!) will see no First Class cabin during these time periods. Between 7 November and 30 November 2018 and also 5 February until 15 April 2019, Emirates will scale back weekly flights between Dubai and Perth from 14 to 11. During these time periods, EK424 will continue to operate on Tuesday, Thursday, Friday and Sunday only. The Airbus A380 nonstop services, EK420 and EK421, will continue to operate daily. These changes come on the back of the recent withdrawal of Emirates from two trans-Tasman routes, and the downgrade of Sydney – Dubai EK416 and EK417 routes from an A380 to a Boeing 777-300ER aircraft. If you’ve booked an affected flight, either via Emirates or Qantas, you should contact the airline for further assistance and advice.Have you booked an impacted flight?